Re-designed to make the everyday extraordinary. The pool deck features all new patio furniture, including tables and chairs under umbrellas for your poolside picnic. The country club quality tennis courts have been resurfaced in US Open colors. They are enclosed with windscreens and offer covered seating. A six-hole country club quality putting green with synthetic turf located in the spacious courtyard. There are two half courts on which to hone your 3-point shot. 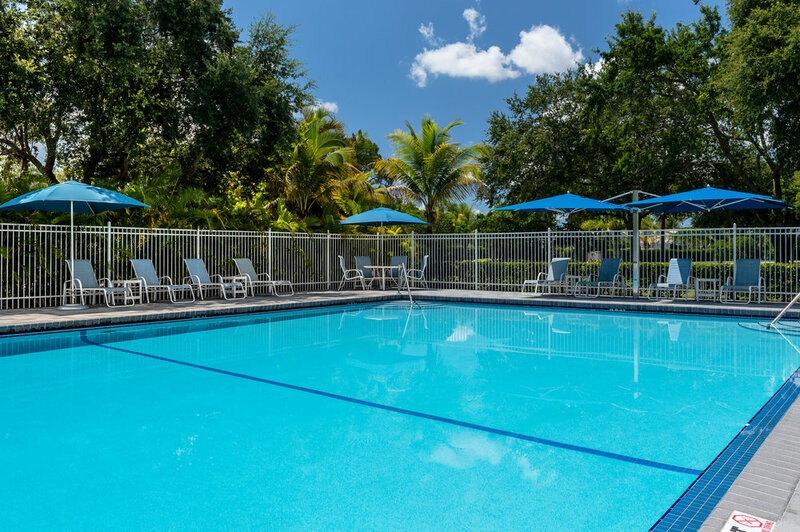 Located right next to the pool, the fitness center offers state-of-the-art multi-functional equipment, an elliptical machine and a treadmill - plus a wall-mounted flat panel TV. Housed in the same building as the fitness center, there are two computers with Internet access. There is also WiFi service around the pool area and on the screened-in veranda under roof for those who want to lounge with their laptops. Beautiful, covered, screen-enclosed outdoor veranda overlooking the swimming pool with free WiFi internet access. Children will enjoy the playground that is designed for kids up to the age of 12 including those with physical disabilities. Palm Court is a pet friendly community! There is no weight limit for dogs. The enclosed Bark Park enables your dog to roam free without a leash and mingle with its dog neighbors. Two barbecue facilities plus adjacent picnic tables under gazebos are located in the courtyard area. A third barbecue area is adjacent to the pool and tennis courts, with nearby seating provided on the screened veranda under the roof or poolside. Palm Court at Wellington recently completed a multi-million dollar makeover! A cozy and quiet rental community of 120 gorgeous 2-bedroom apartments on 6 acres in a beautifully landscaped setting offering plenty of open green space for outdoor living. 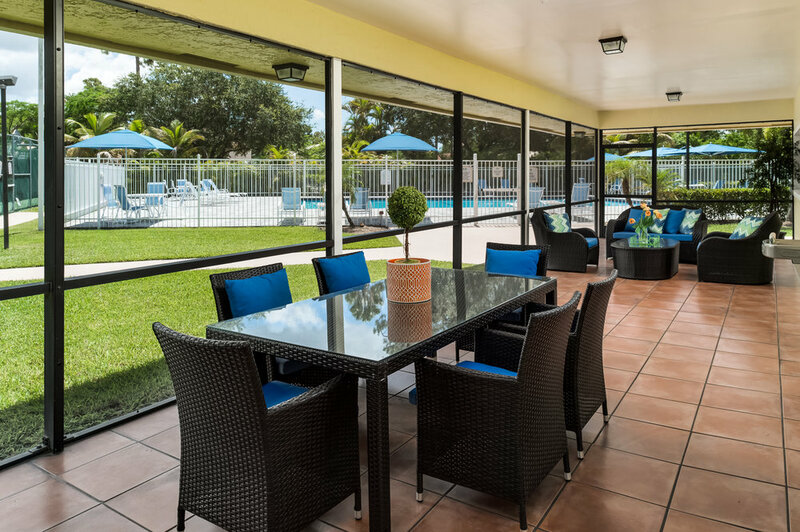 Tucked away in a quiet residential neighborhood, conveniently located minutes from Southern Boulevard, makes Palm Court a quick and easy drive to Florida's Turnpike, I-95, Palm Beach International Airport, Downtown West Palm Beach and virtually every brand name retailer. Make Palm Court Wellington your home!